The Moo Man is coming to Dorset! > The Moo Man is coming to Dorset! Saturday 19th October will see the remarkable story of a maverick farmer and his unruly cows come to Dorset for a special screening of the British documentary film everyone is talking about! 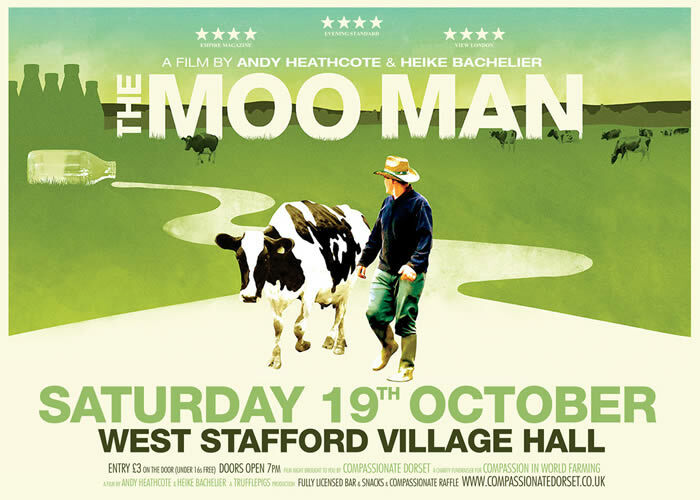 The Moo Man is a film by Andy Heathcote and Heike Bachelier filmed over four years on the marshes of the Pevensey Levels. In an attempt to save his family farm, organic dairy farmer Stephen Hook decides to turn his back on the cost cutting dairies and supermarkets, and instead stay small and keep his close relationship with the herd. However farmer Hook’s plans to save the farm do not always go down well with his 55 spirited cows. The result is a laugh-out-loud, emotional roller-coaster of a journey. You will never see cows in the same way again! Hailed as “The number one movie of the Sundance 2013 Film Festival”, the film is receiving rave reviews and recognition around the world. The Moo Man is a heart warming, tearjerker of a movie about the incredible bonds between man, animal and countryside. According to Variety magazine it is “An endearing portrait of the kind of age-old family farm that’s becoming extinct”. And as the Daily Telegraph say: “This story cannot fail to leave you moo-ved!”. Local animal welfare group Compassionate Dorset have been granted special permission by the filmmakers to have this fundraising film night in aid of the farm animal welfare charity Compassion in World Farming which was itself founded by a concerned dairy farmer, on a mission to improve the lives of farm animals. There will be a fully licensed bar, cakes, a raffle and they will have their popular funky farm animal t-shirts for sale too. The film will be followed by a short Q & A session headed by Compassion in World Farming where people can feedback on the film and its implications for farm animal welfare. Remember to check out the Dorset Energized tips and links on food and farming on our Sustainable Living section.